1) Aluminum Engine Blocks, 2) Plastic Cooling System Parts. Here is what we are seeing (all too often): something in the cooling system fails (usually the expansion tank and/or the radiator) and all of the engine coolant leaks out in a matter of seconds. The driver (hopefully) notices the steam, sees the temperature gauge, or hears the warning chime but keeps on driving (!) anyway because he or she is “close” to their destination. THIS IS A VERY EXPENSIVE MISTAKE!! 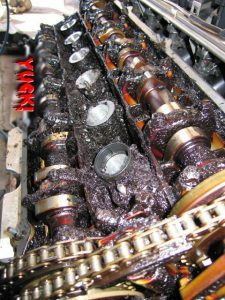 Severe damage to your engine can result! If you ever experience a situation like this, pull over and turn off the engine as soon as you safely can. After you are parked, open the hood to allow the engine to cool off and call a tow truck. DO NOT wait for it to cool down and start driving again or try to add coolant or water and attempt to drive. 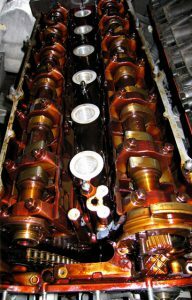 Exposure to overheating can very quickly cause serious engine damage. The pattern of failure seems to be anytime after 60,000 miles. If you have the miles and we have not mentioned a cooling system update, please ask us to check the system on your next visit. You’ll save money & inconvenience. In an effort to give the impression of lower maintenance costs. Many car manufacturers are promoting excessively long oil changes. This has been a failure. The manufactures are starting to see slugging engines in cars that are still under warranty. Most of the cars we service have over 50,000 miles on them, so we see cars at higher miles than the dealer. And with that, we have learned that the extended oil change interval does more harm than good. Oil is the lifeblood of your engine. Performing an oil change with a new O.E.M. filter every 5,000-7,500 miles will make a lubrication related failure next to impossible. There are less than 6 specific engine oils sold that meet the factory specification for your BMW, MINI or Mercedes Benz. Don’t be misled by Quicklube establishments. 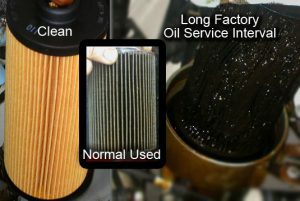 They do not have the proper oil or filter for your car. Most BMW and Mini engines must use a 5/30w synthetic that meets the BMW LL01 specification and Mercedes synthetic oil must meet the 229.5 specification. Consult your owner’s manual for further information on oil quality. Your vehicle’s A/C system is pressurized. The refrigerant gas that produces the cool air coming out of the dash vents is made up of very tiny molecules that can seep through the rubber hoses and gaskets that connect all the other components of the system. Over time, this will result in an undercharge which in turn will cause an over-cycling of the A/C compressor pump and clutch, resulting in premature wear and tear of these expensive parts. You’ll also experience a loss of cooling power and lower fuel economy as the A/C system works harder and harder to keep up with demand. This deterioration is usually so slow it goes unnoticed from season to season until—the system suddenly breaks down altogether! A seasonal A/C service will eliminate these problems and keep you cool all summer long, year after year.